PamKittyMorning: You still can't touch this. You still can't touch this. I remember a long time ago when Frankie was in elementary school and a friend I were talking about getting kids to clean up their rooms. She told me, with great insight, that kids just are overwhelmed and can't figure out how attack it, they just see a room full of stuff and the can't even process it. I distinctly remember this feeling when I was maybe 5 or so, my dad had made me a bookshelf and I had pulled all the books off of it and they were piled up on the floor. My mom probably wanted me to organize them and not just have them jammed willy nilly and not in an orderly fashion, like a library. I was sitting on the floor with the book volcano all around me and was paralyzed. OMG PEOPLE I FEEL LIKE THAT RIGHT NOW. Every where there is stuff and decisions waiting to be made. Keep it - throw it - donate it???? And the keep it stuff. Seriously I have only scratched the surface of millinery flowers I have. And doilies. I've cornered the market. And pictures!!! Does anyone even remember PRINTING PICTURES from websites that inspired us??? I'm having a laugh because I went back in time and looked at pictures here, where Nicole challenged us to show our sewing tables. One of the things on the table is a covered button kit.. JUST LIKE THE ONE THERE NOW!!! Honestly, it's not the same one, Elizabeth and I went through a ton of those, I happened to find that one somewhere else and just set it there today, but still... OMG. You can see some pretty pictures of my studio here on Pat's website for my Aurifil block of the month. And here back in 2008 when Bret put my counter up. Right now it probably still looks like that, just under a bunch of other stuff piled on top! Except for the mushroom lights, those have been moved. Anyway.. I'm still plugging away. 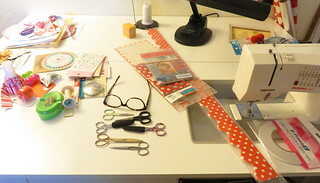 I had hoped to show off a picture of a table with just the normal sewing necessities on it, but so far I'm not there yet. My greatest problem is where to put things. But the week ahead is a busy one, so no time to work on it right now. I'll see you back here with a progress report next week. Or possibly a surrender flag... not sure how I'll feel by then. Happy week people! And I can't even think of showing anyone mine! I made a Halloween strip quilt sewing at a friend's a few weeks ago...lord knows where it went. I have looked everywhere I can think of at least twice. I imagine I put it somewhere really clever and it is laughing at me with your Tailor's ham. I completely understand. I keep getting overwhelmed with my sewing room too. I pick something up, and don't know where to put it, so I basically wind up shuffling things around. I need to step back and make a plan before touching anything else. I am in the process of downsizing our house. I know that I can't take it all with me but it is really hard to get rid of stuff when I know I will just want it again. But I also need to move it all. Really tough choices are being made. And it makes a really big mess. Ohmygosh -- I think you've hit a nerve with most of us. What to do with all the STUFF! I feel paralyzed All. The. Time. I see so many things I want to make, but where to start with All. My. Fabric! I do love your concept of the surrender flag. What will happen if I just raise the flag??? Will someone come and get it all together for me. Hmmmm????? That is how I am feeling right now with my sewing room. I totally get that overwhelmed feeling....I cleared out my studio and now the spare room has a lot of boxes to be sorted out...sometime! !